Have you lost your Microsoft product key? What if Windows can no longer start due to a blue screen or other error, then you may need to reinstall the operating system. To do so, you must have access to a product key (CD Key). But if you can no longer find the product key, you would lose your Windows license. With KeyFinder Plus you could easily retrieve product keys for Windows, Office, SQL Server, Exchange Server and Adobe Acrobat, even if you can't boot your computer into Windows! No other product can recover product keys from non-booting Windows installations. This article explains how you can recover lost product keys (CD Key) from your local, remote or crashed computer especially when you need to reinstall Windows but can't find your product key. 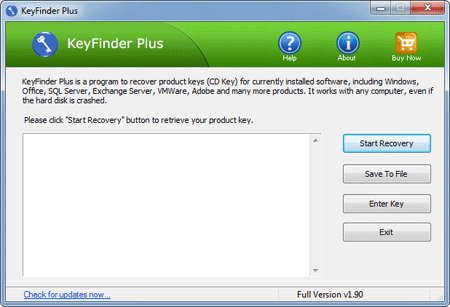 Click here to download the setup package of KeyFinder Plus and save it in a place that is easy to find, such as your PC desktop. When the download is complete, double-click the download file to run the installation wizard. Follow the on-screen instructions to complete the installation. 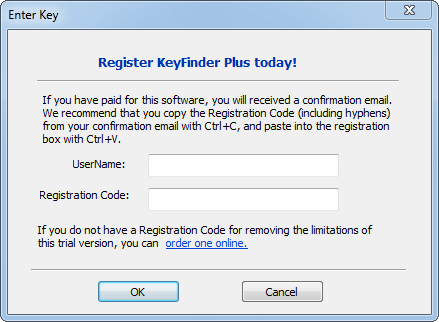 Launch the KeyFinder Plus program. Click the Enter Key button, this will bring up the registration dialog. Enter your User name and registration code into this dialog and click OK.
Click the Start Recovery button, it will bring up a drop-down menu that provides three recovery mode: From current system, From non-booting system and From remote computer. Select one of the recovery mode from the drop-down menu. This mode will scan your local PC for product keys. Quickly recover and display product keys for Windows, Office, Adobe Photoshop, Adobe Reader, SQL Server, VMware Workstation, MS Exchange and and many other software products installed in your local machine. Can't boot into Windows? No problem. Simply connect your crashed or unbootable hard drive to a working computer. 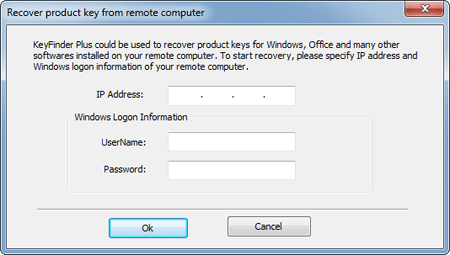 This mode allows you to recover product keys from unbootable Windows installations. This mode enables you to scan network computers and retrieve the product keys for software products installed on your remote network computers.